Located SE of Nelson and NW of Diadem. Name Notes: According to Matty Gibson, this mountain is often mistakenly referred to as Mount Gee by a number of climbers, the local warden service and even their climbing information folders. 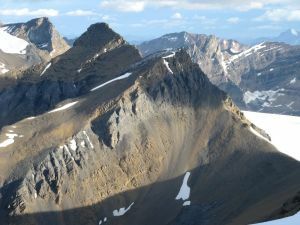 However, the mountain was named Mt GEC. The capitalising is deliberate, as the Place Names of Alberta describes the name as deriving from the first letter of the first names of the three first ascentionists. It is named Mt GEC also on the government 1:50 000 series topo maps.